When GCI Outdoor founder Dan Grace asked "Why isn't there a chair for this?" he created the answer in the Everywhere Chair®. As the name suggests, the Everywhere Chair sits securely on any slope or terrain utilizing the patented Hillside Adjustment™ strap and buckle system. Patented BackComfort™ Technology holds the backrest position at any angle while a lumbar cushion provides maximum comfort. Those who are on-the-go will appreciate the patented Auto-Fold™ Shoulder Strap Technology for easy opening, closing and carrying. 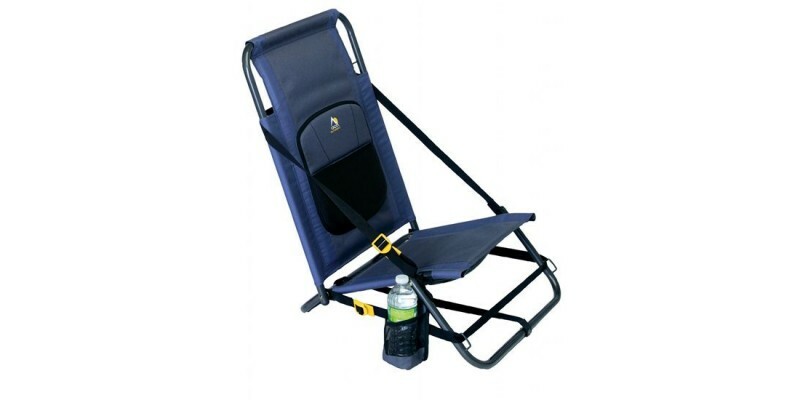 The Everywhere Chair® is constructed of sturdy, powder-coated steel and 600 denier polyester, making it ideal for camping, canoeing, watching sports or participating in just about any outdoor activity. It features a storage pocket and beverage holder. The Everywhere Chair® weighs only 6 lbs, yet it supports up to 250 lbs and measures 16" x 19" x 27" when open and folds to 28" x 19" x 4". Open size: 32" x 32" x 28"
Folded size: 28" x 19" x 4"